The 8 March feminist strike in the Spanish state was unprecedented. Never has there been such a deep and massive mobilisation against the oppression of working class women, against inequality and violence against women. Hundreds of marches took place and became a tsunami of millions in the streets. It reflected the anger of working class women and young people against the capitalist crisis and reactionary Partido Popular (PP - 'People's Party') government. This movement was built from below, on the initiative of hundreds of women's collectives, social movements and left organisations, which worked for months to make this a success. The leaders of right-wing parties PP and Ciudadanos viciously opposed the strike and marches, showing their political agenda is a declaration of war in favour of institutionalised sexism and inequality. 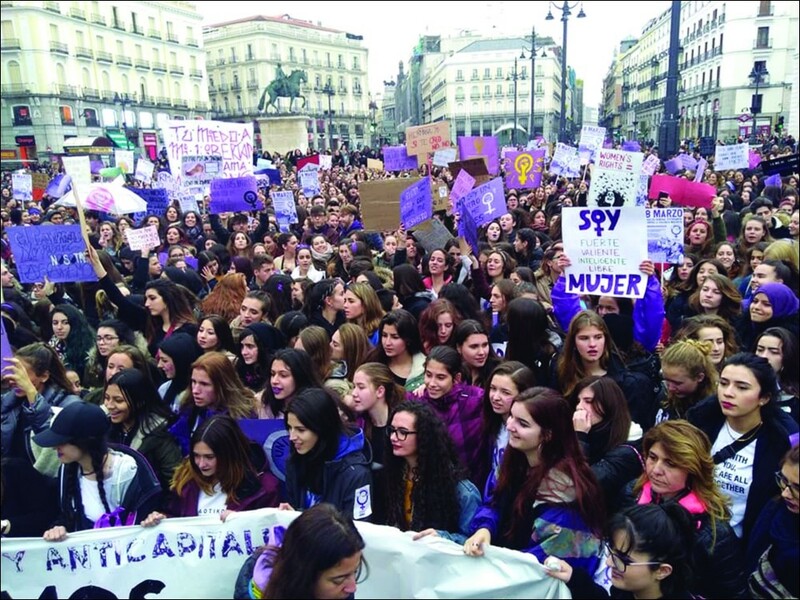 In Madrid, the demonstration could barely move, with an avalanche of hundreds of thousands of women, young people and tens of thousands of male workers. More than one million took part, covering more than five kilometres. And Madrid was not an exception. The same happened in Barcelona, Vigo, Ferrol, Gijon, Bilbao, Gasteiz, Valencia, Malaga, Sevilla, Zaragoza, Tarragona, Cadiz, Toledo and dozens of other cities. The participation of millions of young women and men in this battle reflects the enormous revolutionary potential of the new feminist movement which is developing. In this earthquake of the youth opposing violence against women and sexist capitalism, the Sindicato de Estudiantes (SE - Students' Union), Libres y Combativas (socialist feminist platform launched by SE and IR), and Izquierda Revolucionaria have played a key role. Our call for a 24-hour student strike was massively supported. 90% of students in secondary schools and 80% of university students joined the strike. Thousands filled the streets on our student demonstrations in the morning with more than 150,000 taking part across the state. We need a movement which denounces capitalist patriarchy, but also the PP government, Ciudadanos, and all those who accept the logic of this system of cuts to rights, wages, health and education, of precariousness and sexist "justice" which protects those who abuse women. Despite the two main union federations only calling for a pathetic two-hour strike per shift - which they didn't even organise in most workplaces, only organising symbolic gatherings - millions of women overcame fear and threats to go on strike. Working class women made 8 March a historic day. Beneath the surface there is bubbling discontent and building pressure, in the homes and workplaces of the poorest and most oppressed in society. IR and Libres y Combativas call on all workers and youth to continue the struggle for our present and our future, building a feminist movement which cannot be assimilated by the capitalist class. For a working class, revolutionary, anticapitalist feminism!